Attend this class to learn basic infant sleep techniques that will help establish a routine to ensure your baby sleeps well. 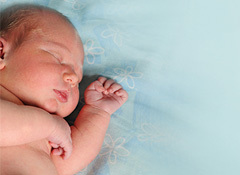 You will also learn how much your newborn should sleep and when you can expect your baby to sleep through the night. This class is open to anyone who will take care of a newborn, including parents, grandparents and caretakers. There will be an opportunity for questions and answers and a free booklet will be provided to participants who attend the class.